Oliver took it upon himself to teach Hazel how to read today. He asked me how he had learned, and I told him that we had started with simple letter combinations, like AT, and then built on them, by adding “B” for bat, and “C” for cat, etc. Oliver: Hazel, A-T says at. Oliver: Good! Now you can read at!! Oliver: Hazel, what sound does B make? Oliver: That is correct. [Note: He really said that!] Now, if you put ‘buh’ with ‘at’, what does it say? Oliver: That is incorrect. It says bat. Oliver: Good! You can read bat now. Oliver: Hazel, what sound does S say? Oliver: Right. Now, if you add S to bat, it says bats. Oliver: Correct! You can read bats now. Oliver: Hazel, what does QU say? Oliver: Good! Now, what does it say at the end of bats? Oliver: Hazel, L-I-N-E says line. Oliver: Now it says batsquline. Oliver (looking at me): Mommy, Hazel can read now. I just taught her. I posted before about anger. This is what I am trying with Oliver and Hazel, to help them manage their emotions in a healthy way. Anger is normal for everyone, but it is my job to teach my kids how to appropriately deal with intense emotions. It isn’t okay to hurt other people, or themselves when they are angry. They also shouldn’t destroy their stuff, because later they would regret it. So, the punching pillow. A natural inclination for my kids (and for me too) is to want to physically vent anger. I realize this probably isn’t the best, but it is what it is. Some people get a punching bag, some people go work out. My kids now have a similar outlet-their punching pillow. Oliver and I talke about the things he wants to do when he is angry, and we wrote them all on the pillowcase. Now, if he gets mad, I can direct him to the pillow until he has spent the physical, overwhelming portion of his anger, before he is capable of talking calmly about it. We will see how it works out. In the meantime, we have an angry pillow. I was reading a blog post by Mama Saga about an activity she did with her daughter during the month of March. I realized that I am a slacker mom whose activities with her own children involve more throwing stuff at each other, dancing and singing silly songs (all of which are important and fun) and probably not enough learning and conceptual stuff. Oliver is smart nonetheless, probably more a product of genetics and less a product of my incessant need to make rhymes out of our conversations. But I’ve seen him flourish in Sunday school classes and under the direction of our incredibly nanny. Since March is over, I had to come up with a new idea. (And note that although I suggested it, Conner actually implemented it, so I actually deserve no credit for this even a little bit.) The slogan for April is that April showers bring May flowers. 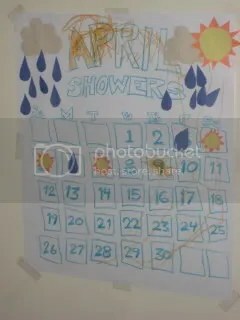 We created a calendar for the month and are putting raindrops or suns on it depending on the weather that day. At the end of the month, we can count up the number of days that it rained and see if there were a lot of April showers. 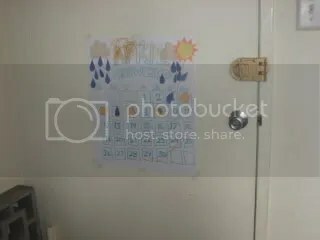 Here is the calendar that Conner and Oliver made this morning. PS: If it’s not obvious, Oliver did the coloring of the calendar… (although it easily could have been me).